Cool project! I checked out the thread on skoolie.net, neat stuff. Any thoughts on the exterior white sheet metal panels? I think it would be great to paint them to look like the existing functional windows. Some black paint with a silver stripe across the middle = semi-stealth camper! (provided the chimney and solar array are down). Would be a good illusion when people stepped inside. Good luck with the project, looks like fun. What you are doing is amazing. I also found your site through Skoolie.net. My family of seven, my wife, 4 children, dog and I just got done with a 4200+ mile trip where we were in our Skoolie Farold for 43 days. My dream is to go fulltime. Your story is truly inspirational. Would you mind if I posted your link on our site? Congrats on your bus... Looks great. Wow! Very inspiring. Thanks for visiting my site, and for inviting me to check out yours. Love what you guys are doing. Keep up the great work!! Wanted to ask you how that shower stuff you used is holding up? I wish we had seen your skoolie earlier because we ended up ordering a shower and spending way too much money. It would have been nice to customize for a lot less. Hi Jami. Thanks for stopping by. Yeah we love the wood ceiling too! We were (and still are) building on a really tight budget as well, but we were fortunate to find a local supplier who gave us an incredible deal on the pine T&G. Actually we got lots of great deals just because people were so curious about the bus idea. Hydrobarrier is the product we used on the shower (basically swimming pool paint) and it has worked out great so far. It was a gamble because the sales person had never heard of using directly on interior plywood, but it is holding out really well. Brandon, thanks for the link. What a great resource, we will be taking advantage of that one for sure! I found your blog through the Homemaker Hop, and had to comment! 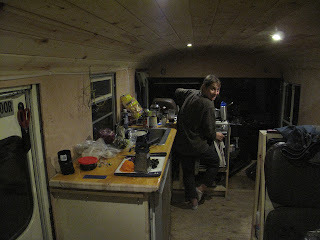 We are a family of eight living in a converted semi trailer which is the same width as your home but twenty feet longer. We live off the grid on 20 acres in central FL, and it sounds like we have much the same ways of thinking when it comes to lifestyle. It is a grand adventure! Thanks for sharing your journey! Thanks for visiting Rose. Wow six kids! We should remember that the next time we feel cramped :) I checked out your blog and your home looks super cozy. It's great to hear about others who are happy living with less. I am including a link to your post and one of your images on the new hop to help send some visitors your way. Thanks again for linking to the hop this week...love the post! Thanks Lisa. I enjoyed checking out the other posts at the first hop, so much great information! We are working on a new post about how we built our solar power system. Hopefully it will be ready in time for the next one. Truly inspiring. We are in the process of downsizing our house by looking for something smaller. Not quite as small as you, but smaller. I was going to say that with four kids and a dog we couldn't do it, but then Rose went and did it with 6 kids so I guess I have no excuse. Your home is beautiful, and I plan to follow your progress. Thanks. Oh yeah, congrats on being featured on the homeacre hop. Thank you Homestead Dad. With kids I would want a bit more room myself. I think its really important to be comfortable in the space you have. 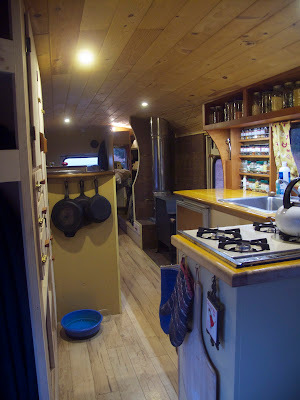 I think what many people don't realize is they they could be just as comfortable in a much smaller space then they are used to, especially if they are not as worrying about high building costs, heating, electric bills etc. We'll let you know how it is with kids in a skoolie. :) Move in is scheduled for the end of the month, though we will not be "done" converting. We have three kids and feel as though we've set up the space well to where everyone can have their own little place. By having a smaller home, we hope that we are forced, in a way, to get out more and see creation. We are trying to adopt a Norwegian saying, "There's no such thing as bad weather, only bad equipment," and attempting to spend as much time as possible out of doors, only coming in for rest and necessary inside chores. I'm surprised that many things we do like school, cooking and laundry can all be done outside (and let's not forget playing!). If it sounds idealistic, that's because it is, but it is a strategy to be able to keep our home cozy and peaceful. Hey HD, I'm afraid you would feel pretty tall on our bus. I am only 5'8" and I've got quite a few inches on Heidi. 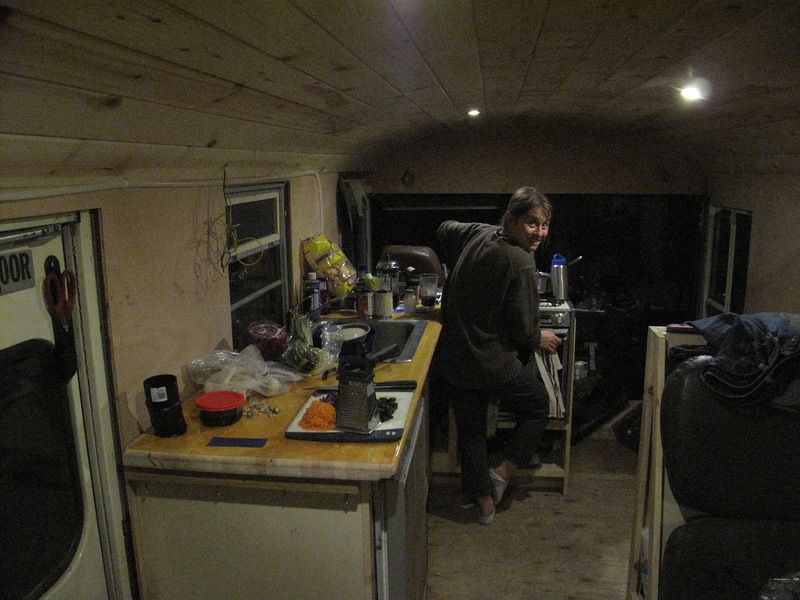 When we bought the bus, the headroom was just about your height exactly, after insulating the ceiling and floor there is only about 5'11" left. If you don't need to insulate, you might be alright. Another more ambitious option is to raise the roof which entails cutting the top off, welding extensions on to the framework and covering the gap with sheet metal. A friend of mine recently had this done to his bus he is 6' tall. 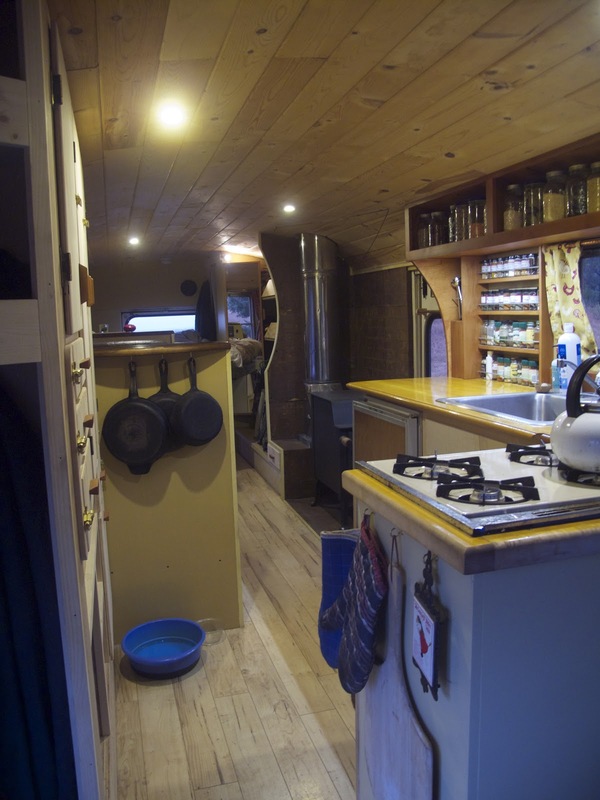 It would likely cost you more then the cost of bus (unless you can DIY), but the end results are pretty awesome. I have also seen some really neat conversions done to box trucks and bread trucks which have a lot more head room. Check out skoolie.net for ideas.